Plot: Without giving anything away, the film is about the life of the 14th Dalai Lama. It begins with the search for him in Tibetan villages, and ends with the person he is today. Why you should watch it: This is a different sort of movie for me to review. The film was released a few weeks after the Brad Pitt vehicle Seven Years in Tibet, so it kind of got lost under Pitt's star power. However this film is an incredible cinematic accomplishment. 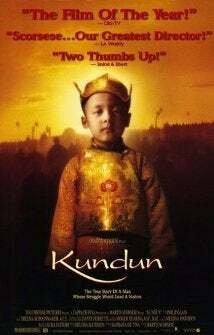 Written by Melissa Mathison, culled from many hours of interviews, Kundun focuses on how the Dalai Lama was chosen, what happened in the early part of his reign, the occupation of Tibet by hostile Chinese forces, and his eventual flight from his beloved homeland. Historically accurate, Mathison's script is devoid of any real action, but that's not what this film set out to do. Kundun is instead an exploration of how the Lama is chosen, what it takes to find him (and where), and what sacrifices he eventually has to make. The actors aren't really actors at all, but instead Buddhist locals selected from India. This lends itself to the simplicity of the film. That is not to say that this is a quiet film. It is a simple film, it doesn't weave in and out of anything. It stays the course of a historically accurate biopic. Under anyone else's direction, this film would be lost. Thankfully Martin Scorsese directed it. Scorsese has trod this path before. If you recall, he directed The Last Temptation of Christ, which was a powerhouse in its own right. Scorsese is Scorsese. We all know his work. His touch is always spot-on. When he needs to be heavy handed and a blunt object, as in The Departed or Gangs of New York, he does it. However, when he has to be delicate, reflective of the subject matter, he is just as talented and successful. He moves at a deliberate pace, but it never seems plodding. The film progresses naturally, and Scorsese knows when to focus on his actors, when to focus on the dialogue, and when to focus on the visuals. Kundun is beautifully shot. Scorsese shot the film in both Morocco and Woodstock, NY. You'd never be able to tell that it wasn't shot on location in Tibet and India. Scorsese used Roger Deakins as his cinematographer. You may have seen his work before - The Shawshank Redemption, Skyfall, A Beautiful Mind, O Brother Where Art Thou?, The Big Lebowski. These are only a few items on his resume. The movie feels both wide open and intimate at the same time. It's incredible when a film of this scope can feel personal. As I said before, this is a bit of a departure from my usual review fare. In saying that, I acknowledge that this film isn't for everyone. However, if you've trusted my judgment before, please do so again. I really hope you give the film a look. Give the official trailer a look. I can't stress how much I love, love, love this film. Regardless if you are religious or not, or what your denomination may or may not be, Kundun is a brilliant movie.